Mouse ear is a small perennial plant; creeping, leafy runners propagate the plant so that it forms dense, weedy patches. The bristly, spatulate leaves, forming a basal rosette, are green on top and downy-white beneath. 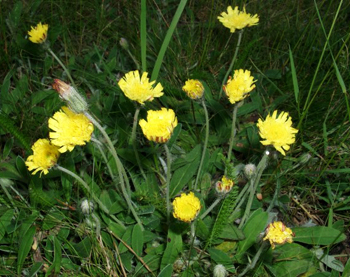 Solitary, although sometimes 2-4, yellow flowerheads rise from 4-15 inches above the ground on bristly scapes and are subtended by hairy, pointed bracts. Flowering time is from May to September. Culpeper says that this herb stays green all winter. There is a plant called Virginia Mouse-ear (Cynoglossum morrisoni) that is a related annual plant similar in appearance to hound’s tongue but with white or light blue flowers. The root is an effective astringent. 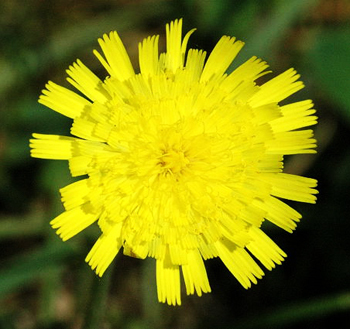 Grows in dry soil on lawns, fields, pastures, hilly areas, and waste places from Ontario south to New York and Pennsylvania, and west to Michigan and Ohio. Gnaphalium uliginosum is called also mouse ear. H. pilosella is said to be so powerful as to harden iron or steel; that if any edge or pointed tool is often quenched in the juice of this herb, it will cut all other iron, steel or stone very easily without turning the edge or point. Alchemists recommended the juice to congeal mercury, but all these fancies are not accepted today, of course. Also, the claim that if this herb is given to a horse, the shoeing of the horse will not cause the horse pain. Used for diarrhea and a gargle for throat problems. As a powder, sniff it into the nose to stop the nosebleed. The decoction used for liver and spleen problems, dropsy, jaundice, blood purifier, cankers, ulcers, sores, and bladder stones. Taken over a long period of time, it is reputed to help cataracts, but this claim has been disputed. Externally, helps heal wounds. Infusion: steep 1 to 2 tsp. in 1 cup boiling water. Take 1 cup per day. Decoction: boil 1 to 2 tsp. of the herb in 1 cup water until 1/2 cup liquid remains. Take 1/2 cup per day.